Clark Tanks are a preferred brand for reliable stock water tanks in the country. This is evidenced by the tens of thousands of tanks purchased from us by landowners for rural water storage. 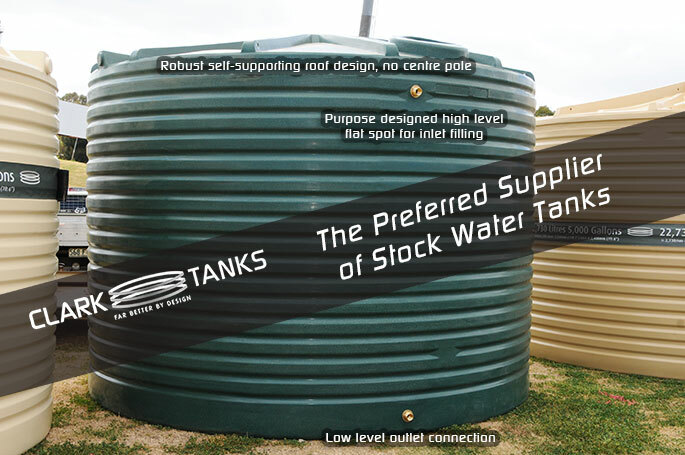 Our iconic 5000 gallon stock water tank is a very popular choice with landholders who are located in drought affected parts of Queensland, NSW and Victoria. It is purposefully designed for stock water projects with its self-supporting roof design (no centre pole), two high level flat spots for both inlet and float set up from a bore, and convenient fitting of an overflow pipe. Do You Need Stock Water Tanks? Clark Tanks respond quickly to the peak demands that the dry weather can create as you need to respond to diminishing supplies of stock water. Request a quote today using the form above, or talk to our friendly staff on 1800 252 758.